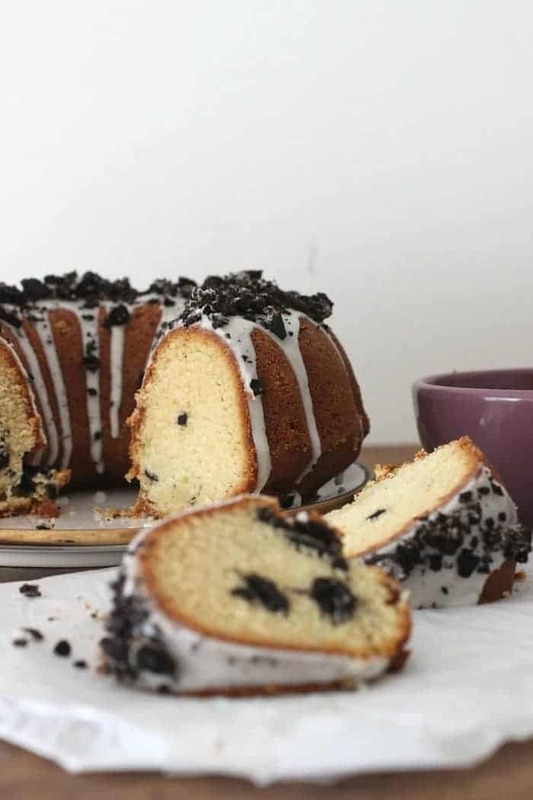 Vanilla Oreo cake is what happens when you add chopped Oreos to an already wonderful vanilla bundt cake. The best of both worlds, right? Oreo cookies are probably the best selling commercial cookies ever. I don’t think we even need to google that fact. I live in Buenos Aires and it was a while before they were sold here. But boy, did they become popular quickly!. We even had one with a dulce de leche filling (our favorite spread by a landslide), but I don’t know if they’re still available. 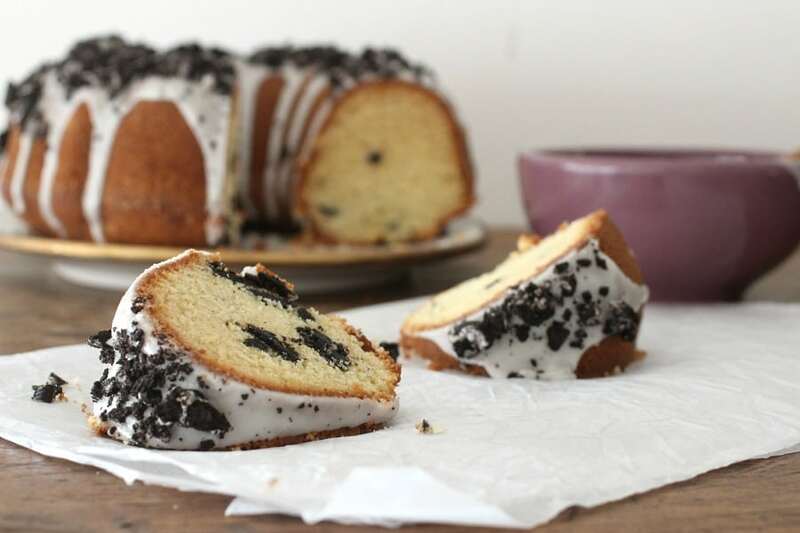 Anyway, back to our vanilla oreo cake. 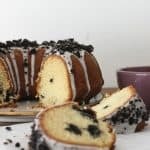 It’s such a simple idea this oreo cake, but, as with so many simple ideas turned into recipes, it delivers big time. 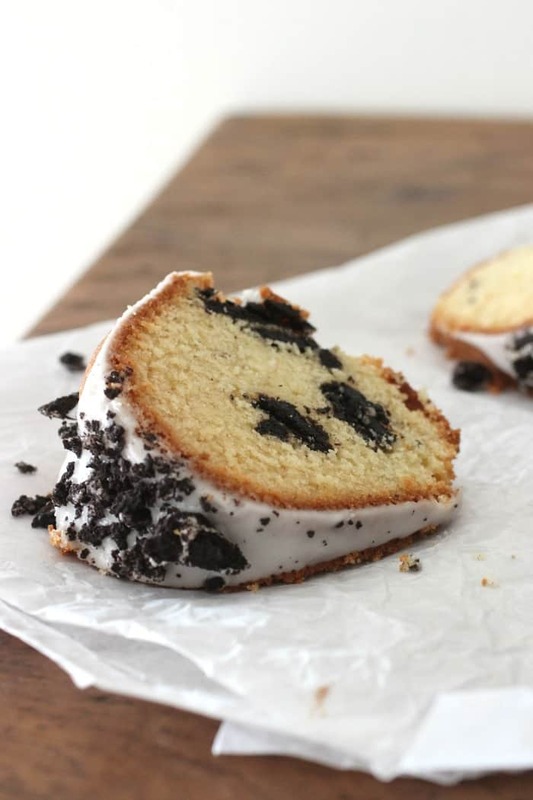 A great vanilla flavored crumb, not too tight not too airy, with bits of chopped Oreos – with filling, of course – that lend to a crunchy surprise. 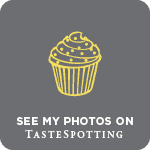 Then there’s a simple powdered sugar glaze crowned with some more chopped Oreos, not just for decoration – a poor one at that – but as an extra layer of chocolate flavor and crunchiness. You can add more chopped cookies to the filling, but I prefer them on top. Otherwise, the vanilla cake will be too crowded. Maybe not. As you wish. I’ll explain all in the recipe. 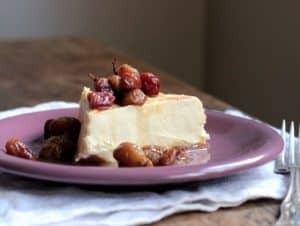 Even though vanilla cakes are seen as plain, I find them to be very intricate, as they need to have a good balance of vanilla flavor and just right crumb texture to make them amazing. 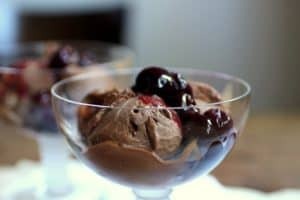 Since you rely only on vanilla extract for flavor, make sure it’s a premium one, made from real vanilla beans, and not those horrible things containing syrup and artificial vanilla flavor. What kind of Oreo cookies can you add? You can add any flavor Oreos, of course. 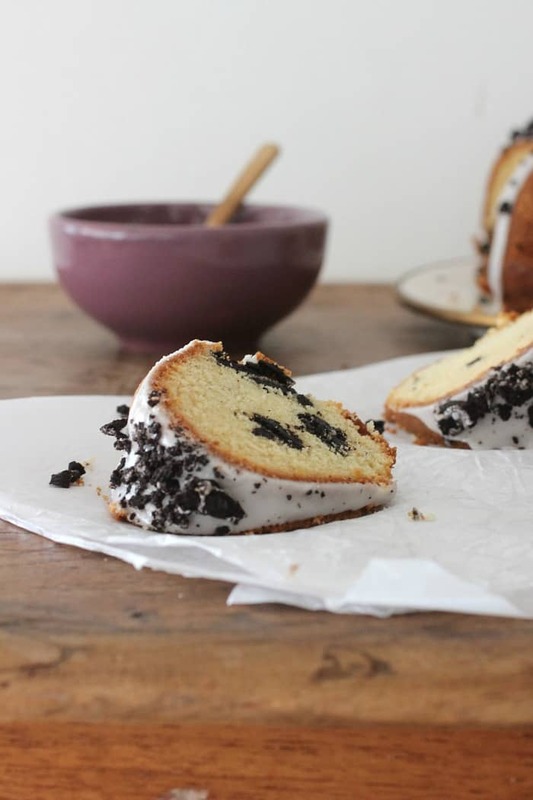 It’s a make-your-own-adventure idea with this vanilla oreo cake recipe. Enjoy!. Preheat oven to 350ºF – 180ºC. Butter or spray a 10-inch (26cm) bundt pan. Dust it with fine breadcrumbs or flour, shaking off excess. 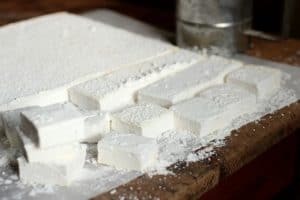 In a large bowl, beat butter while gradually adding sugar until it is pale and fluffy, 3-4 minutes. Add extracts and mix well. Sift together flour, salt and baking powder (I sift them directly over the butter mixture while adding them in two parts) and add them in 3 additions alternating with the sour cream in 2 additions. The batter will be dense. Make sure it has no lumps, but don’t overbeat. Coarsely chop 3/4 parts (13-15) Oreo cookies, with a kitchen knife, and add to the batter by hand. Give it a few mixes but not much since you want the cookie pieces to stay pretty much the same. 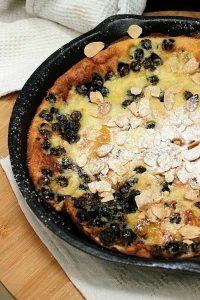 Pour into the prepared pan, smooth the top and bake for 50-60 minutes, or until a tester comes out clean. Let cool for a bit on a wire rack and unmold carefully. Let cool completely on the wire rack. Mix sugar and milk until creamy. Pour on top of the cooled cake and let it run down the sides. Add the remaining finely chopped Oreo cookies on top. It keeps for a few days at room tº, well wrapped. Or refrigerate it. I divide the Oreo cookies roughly 3/4 amount in the batter and 1/4 on top as decoration. You can vary that amount, but be sure to add some on top with the glaze. Besides the crunchiness, it adds another layer of flavor that goes a long way towards the final flavor of the cake. What a terrific looking bundt cake! I have never thought of using oreo this way…fantastic, Paula. Oreos are a staple at our house. I don’t particularly like them unless they’re in a dessert! So this cake would make me AND the Oreo loving family very happy! hahaha, Oreos took over houses everywhere! So nice to see you here Liz! I thought for a minute there you were going to take credit for Oreo Cookies. No. No. No. I’ll give you Dulce de Leche but we in the Midwest claim Oreos. (As Liz verifies in her comment.) As a kid growing up we had Cookie Pudding for dessert every Christmas. It was a combo of whipped cream and crushed Oreo cookies. Every so often I want to make that but I resist. I have never thought about just throwing a few into and on a cake – great idea. Yeah I know, Oreos rule… I love that they go with almost anything. 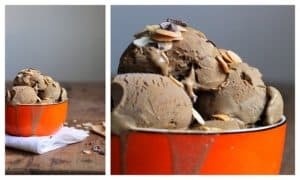 The no-churn Oreo ice cream is a wonder also, only 3 ingredients. I need to try your pudding Mary!